The City of Seattle has released a Draft Environmental Impact Study (EIS) on the 2035 comprehensive plan. 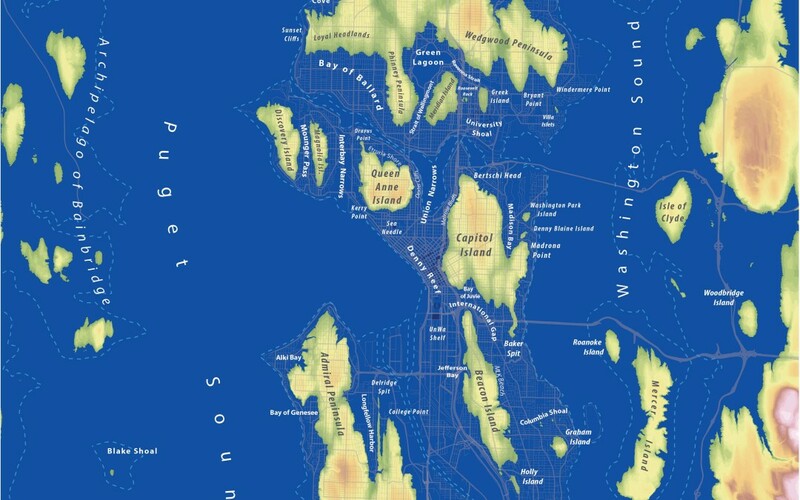 Featured in the section Planning for Seattle’s Sea Rise is the Islands of Seattle map made by The University of Washington’s campus planner, Jeffrey Linn, in 2014. The map is not only a beautiful art work, it reflects what Seattle (and Bainbridge!) will look like in many hundreds (if not thousands) of years when all the ice on the planet melts. That’s a long time from now. So what kind of sea level rise can we expect in the near future? The City of Seattle’s 2035 report states that we expect up to 7″ of additional sea level rise by 2050 (beyond the 6″ we’ve already experienced in the past century). That’s a little over a foot of sea level rise in a century and a half. It may not sound like a lot, but another 7″ of rise can make a big difference during an extra high tide or a storm surge. How should Bainbridge Island prepare for sea level rise?